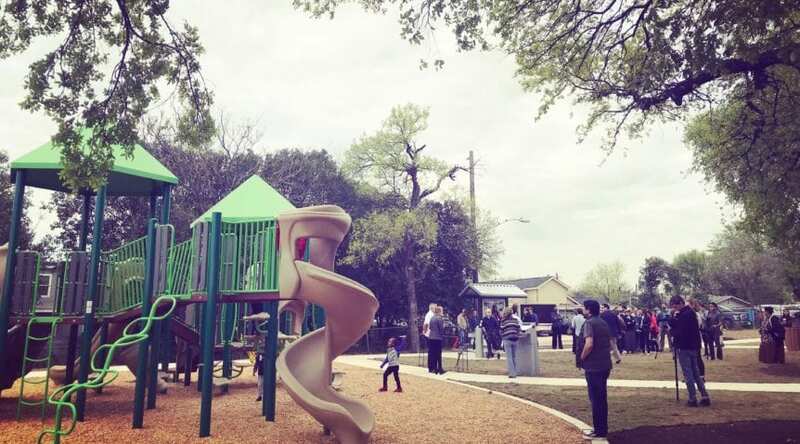 St. John Park underwent a complete redevelopment after receiving Austin Parks Foundation’s inaugural ACL Music Festival Impact Grant of $100,000 in 2017. The Northeast Austin project broke ground in November of 2018, and APF is thrilled to have officially opened the park to the public with a ribbon cutting on Wednesday, March 20. Council Member Greg Casar, Austin Parks Foundation and Dell Technologies Match Play Representatives, along with the Parks & Recreation Department, as well as Anissa Castillo and Thelma “Grandma Wisdom” Williams of the St. John Neighborhood Association attended this special ribbon cutting. Over $450,000 helped to create this vibrant and usable recreational space for the community. Besides the Impact Grant ($100,000), funding from the City of Austin 2012 Bond ($200,000), APF’s Board Designated Funds ($50,000), APF’s 2017 Dell Technologies Match Play proceeds ($100,000), and a community gift from Sunrise Mini Mart ($200) supported the transformation of St. John Park. Most noteworthy are the new amenities in the park. Before, the park contained only a closed pool, but the redevelopment includes an entry plaza, park info kiosk, water fountain, pavilion, playscape and swings. Finally, with a new open lawn and looped walking trail, St. John Park brings new life to the community, and a place to gather as neighbors.